ATTENTION, MICHIGAN AIMI FAMILIES, if you think presidents have no power regarding America's mental health care system, consider the damage done by President Ronald Reagan in closing mental hospitals without provisions for community treatment and subsistence assistance for tens of thousands of psychiatric inpatients he released, including some who had been hospitalized for decades. Their deinstitutionalization without proper provisions for continued treatment and subsistence gave rise to today's tragic denials of treatment, which usually end in incarceration. Today, 1.25 million of America's inmates are mentally ill. Closing hospitals without providing for continued care of former psychiatric inpatients caused patients, families, and communities to suffer. And still we suffer, although over $100 billion per year of tax dollars is spent to continue mass incarceration. Many former inpatients wandered homeless on our streets after Reaganomics closed mental hospitals, and even in 2016, America's chronically homeless population are mostly persons with mental illness and substance abuse issues. Some former inpatients starved to death after "deinstitutionalization" or were burned to death in vacant houses and abandoned warehouses. Others died from neglect of physical diseases, and some were killed by police‬ during lunacy arrests, but most were arrested for vagrancy or panhandling. Once arrested, mentally ill citizens' sentences are lengthened if they "disobey" prison rules they don't understand. Yet, taxpayers saved nothing when hospitals closed or reduced services because Medicaid insurance would no longer pay for inpatient psychiatric services. Working class people simply cannot afford private psychiatrists and care centers, but we can rely on Bernie Sanders. The Washington Post wrote, "Michigan's primary Tuesday is critical for Bernie Sanders. The state is offering 147 delegates, the most since Texas. (Mississippi is also voting Tuesday.) 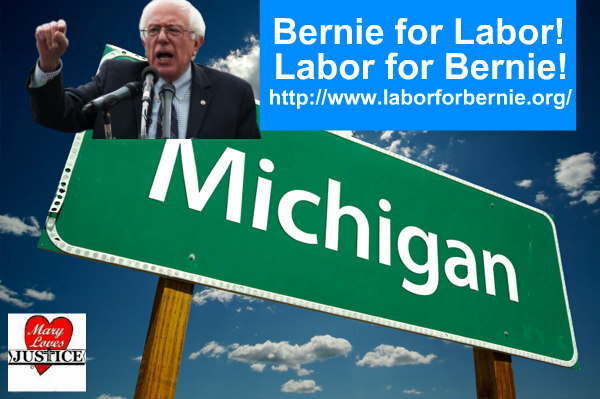 Michigan's middle-class, union-voter makeup has the potential to play to Sanders's strengths." ~ Sanders is against the Trans-Pacific Partnership Agreement (TPP). TPP is expected to negatively impact U.S. workers and limit Americans' use of Internet services. ~ Sanders is against racism and always has been. He was arrested as a 21-year-old college student at Chicago University for demonstrating with Blacks for better educational opportunities. ~ Sanders is against privatizing prisons and jails. He and others in Congress introduced H.R.3543 in September 2015, the "Justice Is Not for Sale Act." If it passes, our local, state, and federal government will be barred from contracting with private prison companies, and predatory pricing on prisoners' phone calls, etc., will end. ~ Sanders would raise minimum wage. ~ Sanders would give free tuition for qualified students and lower the interest on student loans. ~ Sanders is for universal healthcare. ~ Sanders voted AGAINST the Iraqi War. ~ Sanders voted against the National Defense Authorization Act (NDAA) in October 2015. ~ Sanders is for unions and workers' rights. ~ Sanders is censored like AIMI is, and his supporters are apparently censored. News reports largely ignored the fact that demonstrations supporting SANDERS FOR PRESIDENT were held in from 45 to 70 cities throughout the nation before Super Tuesday. Mary Neal, a/k/a MaryLovesJustice, (678)531-0262, MaryLovesJustice@gmail.com, Wrongful Death of Larry Neal http://WrongfulDeathofLarryNeal.com/main.html, Director of Assistance to the Incarcerated Mentally Ill, Human Rights for Prisoners March, the Davis-MacPhail Truth Committee (an anti-death penalty organization), and "Human Rights Demand" radio channel at Blogtalkradio.